The quinoa was a new trial crop for this year. Seeds came from Realseeds and were started in modules in the latter half of April. I planted a few seeds in each potlet and didn't thin, allowing several small plants to develop. These were then planted out a few weeks later into good soil, the multiplanted modules spaced about 50cm apart. No fertilizer was added. Apart from looking like a row of weeds for most of the summer the plants grew strongly and quickly reached about 1.5m in height. Reasonably drought resistant, I only watered them once during the year, shortly after they were planted out. Despite being sold as Rainbow Quinoa they were rather dull, the picture above was taken less than a month ago and looks like nothing more than a row of out of control Fat Hen but within the last three weeks a transformation has occurred. Glorious colours! Unfortunately this has coincided with some strong winds so the plants are toppling over a bit but for a late summer display they would even take a place in the flower border if adequately staked. Cover the rather bare and ugly lower stems with a row of rudbeckias and it would be prize winning. 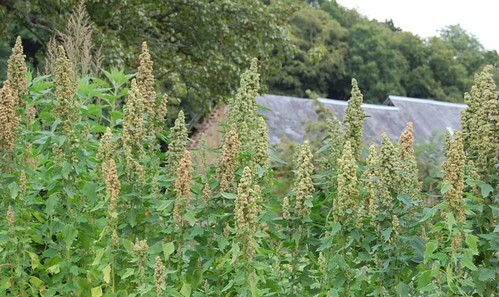 Something I've only just discovered is that this quinoa, Chenopodium quinoa will apparently interbreed with Chenopodium album (aka Fat Hen) and presumably other chenopods like our over abundant Magentaspreen. This is a bit of a blow as I expected to be able save seed for next year from this year's crop. Still, I still have some seed left from my original purchase and will grow a seed crop from that next year under better controlled conditions. Still to come, harvesting and cleaning. Harvesting should be relatively easy, by threshing the dry heads over a tarpaulin and then gently winnowing to remove the chaff. Cleaning may be more problematical, if only because I've never had to do it before. 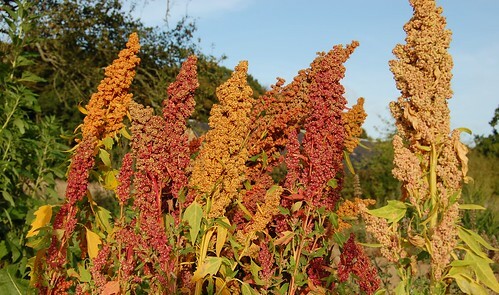 Quinoa seeds are coated with a saponin, a bitter soapy chemical which discourages birds and deer from feasting on them. In order to render the seeds edible they must be washed or physically rubbed to remove the coating. Commercially, rubbing or abrasion is often used because it lends itself to large scale mechanisation and removes the need to re-dry the crop after processing but most home and small scale production is prepared by washing, with up to five changes of water needed before the seed becomes edible. We'll have to see how this goes. If it's possible to dry the seeds after so that they don't go mouldy in store it might be a task that can be undertaken as a single job but I'm wondering, for the small amounts I will have, if it would be better to store the grain unwashed and only wash as needed. More reports as the situation develops! We've included quinoa in our meals before. A friend from Chile helped us with the pronounciation (keen -wah). The colors are beautiful! Keep us appraised of how the harvest/washing/storage/eating goes!